With the content staging tool, HubSpot CMS users can redesign and relaunch a website in a sandbox development environment. You can import existing HubSpot-hosted pages or create new pages from scratch. Any content created and published in content staging is hosted on your-domain.sandbox.hs-sites.com. After you've reviewed the live proof of your redesigned site, you'll take your new site live to replace your existing live site all in one click. Please note: changes made to any page template or global content in content staging will be reflected on live pages using those assets. It's recommended to clone your templates or global content before editing them in content staging. Learn how to plan your website redesign strategy. Understand how to work with a template layout or coded template in the design manager. Update your page logo, fonts, and branding in your settings. Note that you won't use the content staging tool for a blog redesign. Instead you can replace your blog template in your settings. Please note: the content staging tool doesn't currently support multi-language content. In the lower left, click the More tools dropdown menu and select Content staging. On the content staging dashboard, you can review your existing website and any staged pages. Use the domain dropdown menu to view your existing pages for a specific domain. The domain selected here is where your redesigned pages will be published and hosted. Use the All page types dropdown menu to filter for landing pages or website pages only. By default, all your landing pages and website pages will be shown. The Manage tab contains the existing pages on your site. You can click the Publish tab to see redesigned pages that have been published on your sandbox domain. The Log tab includes any pages that were moved over to your live website. Unmodified: a list of existing pages that haven't been modified in the tool. Staged draft: a list of pages that you've started to stage but haven't yet published onto your staging domain. Staged proof: a list of pages you've published on your staging domain. Review your work here before taking it live. More tools: click to expand the tools you use to manage your website, including your design manager, file manager, and content settings. There are three ways you can use the content staging tool to redesign a page. Use this option if you want to keep some of your existing content on the redesigned page. Hover over the page you want to stage, then click Stage. In the dialog box, select Stage cloned page. Click Stage page to open a clone of your live page in the content staging editor. Make your edits to your content in the page editor. Keep in mind that any changes to your templates, global content, or stylesheets will impact existing live content. After you complete your edits, click Publish to staging. Use this option if you want to create a completely new page to replace an existing URL on your site. The page you design in content staging will ultimately replace the original live page you're staging. In the dialog box, select Stage blank page. Select a template for your new staged page. Keep in mind that any changes to your templates, global content, or stylesheets will impact existing live content. Make edits to your content in the page editor. After you complete your edits, click Publish to staging. Create a new landing page or website page from scratch in content staging. Use this option to add a new page to your site that didn't exist before. If you're adding new pages to your site, be sure to review your advanced menus and create a new navigation for your redesigned site. In the upper right, click Create a new staged page. Select whether you want to stage a new Site page or Landing page. Click Stage new landing/website page. 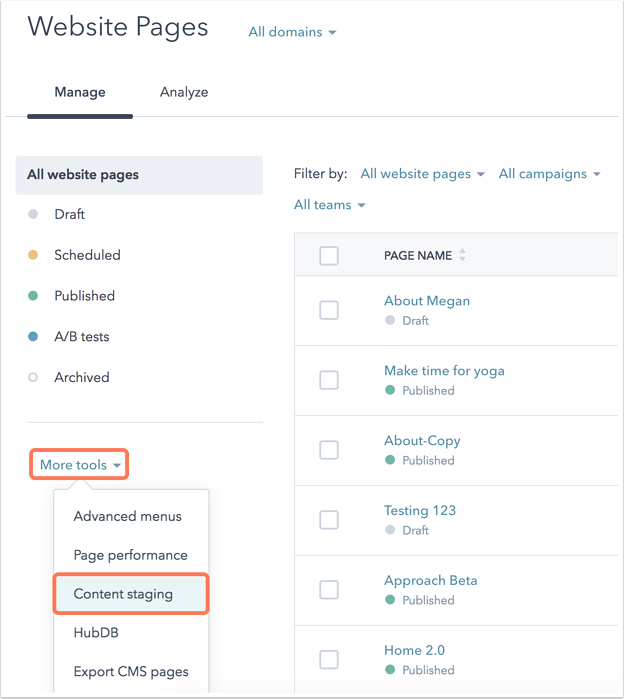 After you've published a page to content staging, click < Back in the upper left corner of your page details to return to your original pages dashboard. Click the More tools dropdown menu and select Content staging to return to your content staging tool. After you've completed your website redesign, you can take your pages live. Your staged pages will replace the live URLs of your site. Your original pages will be archived after you take your staged pages live. This means that links to these internal pages associated with any forms or menu items will be lost. 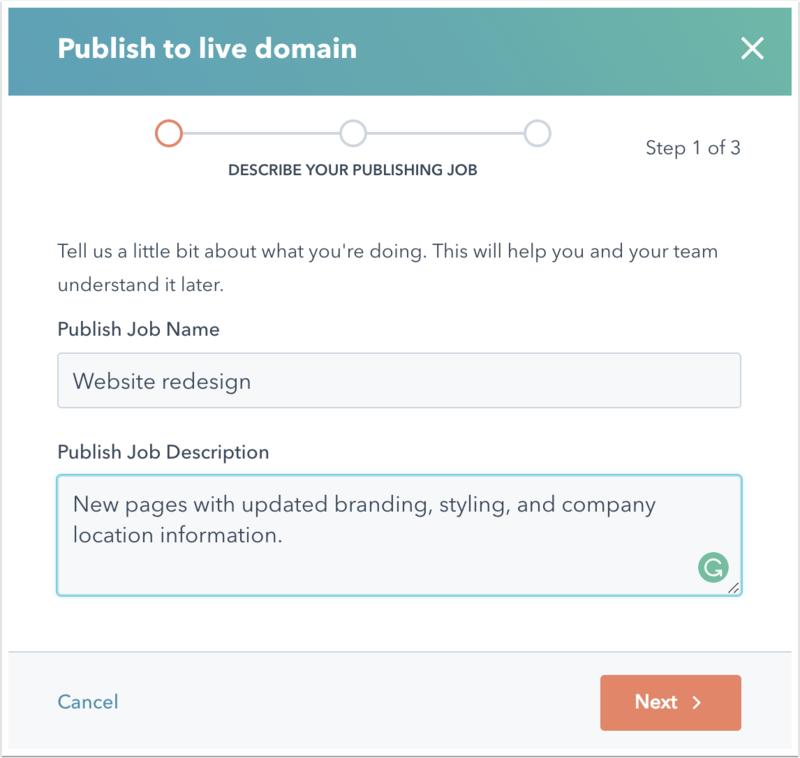 If you have a form set up to redirect to any of your staged pages upon submission, you'll need to update your form options to redirect to the full URL of your page. If any of your advanced menus are linked to the internal page names of your designed pages, you'll need to update these menus before launching your stage site. Using the full URL of the page rather than the page name ensures that your links will continue to work on the new version of your site. On your content staging dashboard, click the Publish tab. To publish a single page, hover over the page name and click the gear icon settings dropdown menu, then select Publish to live domain. To publish pages in bulk, select the checkboxes next to the page name. Then, click Publish x pages to live domain. Give the publishing job a Publish Job Name. You'll use this to review your publishing history in the Log section of your content staging tool. Enter a Publish Job Description of what was changed and why. Review the details of your publishing job, including a list of all the pages that will be updated. If everything looks good, select the checkbox to confirm, then click Publish. Your job will be placed in a queue for publishing. You can review the status of the job in the Log tab of your dashboard. When your job is complete, you'll see a complete history of your job and the published pages.